Mariana Abrantes de Sousa is an economist with degrees from the University of California Berkeley and Princeton University and extensive experience as an investment banker and international finance consultant. She worked as financial controller in the Ministries of Health and Transport, reporting to the Portuguese Minister of Finance from 2006 to 2010. 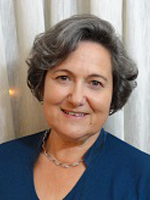 She is a member of the Portuguese Economics association and the Portuguese Institute of Corporate Governance IPCG. Mariana has been involved in the movement to recognize Aristides de Sousa Mendes for over twenty-five years in the US and Portugal. Born in Coimbra, Portugal, she holds US and Portuguese citizenships.